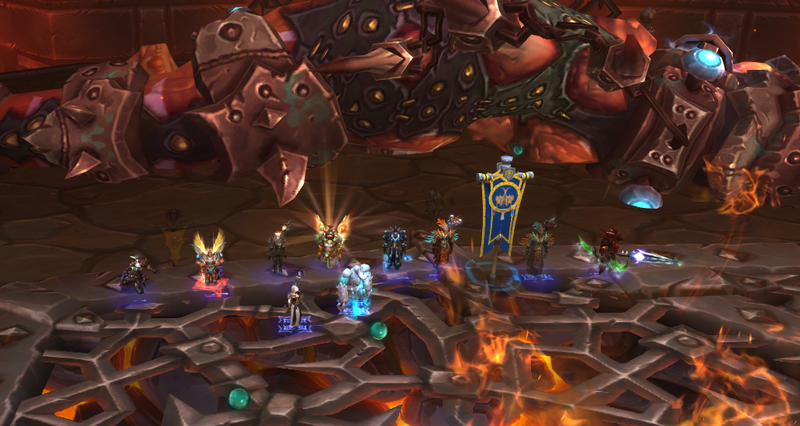 After our Easter break that seemed to drag on for over a month and raids happening only sporadically we finally got some good tries in on Thok Heroic last week. A few around 10% another at 1% and 3%. We called for last try. And for the first time in SF History the "Power of Last Try" failed us and showed us the finger. We wiped at 0.001% ... 10k health left. It was hilarious to say the least. Wish we were recording our Mumble chats. Well this week - after some hiccups involving car tires - we got back to Thok Heroic and had a dinolicious BBQ. There you go! Re: 0.001% extra dps matters! Apart from that, congrats. Sadly an hour too late vs the guild that we wont name, but... who cares, -we- are doing great, and have a chance at finishing the instance before WoD. Keep up the good work guys! Also, 8th on the server, among guilds active in 2014. I can't help but notice that I'm missing from this picture. Is there a connection? I can't help but wonder if you were getting into position for a particularly delightful yank?